The Hilton Garden Inn Houston Westbelt hotel is located on the corner of W Sam Houston Pkwy S and Bellaire Blvd in the heart of Chinatown. We are in a great location with easy access to I-10 Hwy 59 and I-45. You will be within reach of Houston*s Galleria Mall Memorial City Mall and First Colony Mall. Located just steps away from Westheimer Rd. enjoy many fabulous restaurants entertainment venues and more. 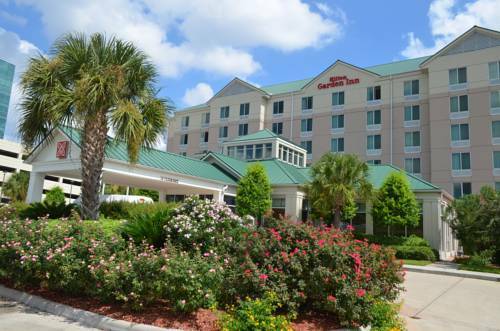 The Hilton Garden Inn Houston Westbelt hotel is near the growing Westchase District which is home to many large corporations including Halliburton Jacobs Engineering Schlumberger National Oilwell Varco Emerson IBM and many other great companies. Houston is home to the South*s largest Asian population and boasts an extraordinary look and feel into the Asian culture. Come visit Chinatown and experience an interesting and unique side of Houston Texas including Hong Kong City mall the biggest Asian indoor mall in the southern states Jade Buddha Temple Dim Sum at Ocean Palace Splash Art Gallery Houston Asian Heritage Tour Chopin*s Corner Library featuring over 30 000 fine arts books recent newspapers and magazines from Taiwan the Forbidden Gardens in Katy Texas and Japanese Gardens in Hermann Park. The Hilton Garden Inn Houston Westbelt hotel features 118 rooms and two executive suites upgraded rooms with jetted tubs. complimentary WiFi and parking. remote printing provided by PrinterOn 24-hour business center 24-hour fitness center. outdoor pool and hot tub. full-service restaurant offering breakfast dinner and evening room service. 24-hour coin operated laundry facility. 24-hour Pavilion Pantry. 1 500 sq. ft. of meeting space. Hilton Garden Inn Houston Westbelt guest room amenities Microwave mini-refrigerator Keurig coffeemaker with tea and coffee selections 42-inch LCD TVs spacious work desk with two dual-line phone voicemail and data port iron and ironing board and hairdryer. Excellent food with inspired menu not your typical hotel food. Open continuously from 630am-1030am for hot American breakfast /Mon-Fri/ 7am-11am/Sat-Sun/. Dinner and evening room service start from 500pm through 900pm /Mon-Sun/. We proudly serve Starbucks coffee throughout the hotel and restaurant. Ready to sit back and enjoy the rest of your day. Come join our welcoming atmosphere for happy hour specials in the Pavilion Lounge with flat screen TVs and bar stools. We proudly serve Starbucks coffee throughout the hotel and restaurant.